Tessa is the sole survivor of a group of young women who were left for dead in a mass grave, which was then planted with flowers. The Black-Eyed Susans became a metaphor for the trauma she experienced. This thriller, Heaberlin’s first following a highly respected career in journalism, is a great read with a few problems, most of which have to do with trying to cram too many details into a single novel. It was looking like 3.5 stars to me until it passed the halfway mark; then it hit its stride. Ultimately, the eloquent manner in which issues surrounding the death penalty were braided into the narrative won the final .5 star from this reviewer. And at this point, I have an obligation to tell you I read the book free, and to say thank you to Net Galley and Random House Ballantine for the DRC. The book will be available to the public August 11. Tessa is an adult, a single parent, and it’s been twenty years since her abduction and attempted murder. There are memories she tries to bury, and there are other niggling details that she can’t make sense of. In a writing style somewhat reminiscent of Jodi Picoult, Heaberlin flashes us back and forth from Tessa’s adolescent memories to the present, a life in which her sole objective at first is to protect her own teenage daughter, Charlie, whom she is afraid may pay the ultimate price. Because Tessa’s stalker has been planting Black-Eyed Susans in her yard and various other places, and she is scared half to death. Strange, threatening packages appear in the mail. And her best friend Lydia disappeared mysteriously not long after the trial. There are so many shadows, so many possible threats out there that her inclination is to retreat into her artist’s studio, and into her home. Don’t rock the boat. The problem is that an innocent man is about to become one more victim of Texas’s capital punishment. Her supposed attacker, the supposed killer of the other Susans, waits on death row…and the clock is ticking. She knows he didn’t do it, and she’s been holding out. Once she decides to testify to his innocence, will she be believed? Can she get there in time? A tremendous amount of research went into teenage trauma and its possible affects, and the capital punishment process (and the process of its defense) in Texas. Heaberlin has done her homework; if anything, she may have done a little too much, or tried to incorporate too much of her work into one novel. Somewhere around the 37 percent mark, I found myself not mystified, but confused. What were all these references to the OJ Simpson trial doing here? Who the hell is Jo? Is Lydia dead, moved away, or what? The suspense fell away while I stopped reading in irritation to go back over the book and try to discern what I had missed or forgotten. However, just before the halfway mark, the author found her stride and everything came together. From that point till ninety percent, I was riveted. Portions of the text approached the level of literary fiction. I found myself questioning my earlier complaints, and went back and reread the passages I had marked earlier to see whether I had just been distracted, or in a snarky frame of mind. But no, the inconsistency is really there. The supernatural bits about the other Susans being in her head, talking beyond the grave, may have turned up in the author’s research as a possible outcome of trauma, but they felt extraneous to me, as if they had been shoe-horned into the text. If I had been her editor, I would have cut them. I was not entirely happy with the ending, which felt a bit contrived, but I was so deeply satisfied by what I had read up to that point that I didn’t feel let down. My advice to the reader is this: if you are opposed to the death penalty and love a good thriller, get a copy of this novel. I think you’ll find it as satisfying as I did. You may want to flag pages where you have questions with sticky notes, or mark it digitally if you read it that way; later on it will all make sense. And whatever you do, remember: there are no millionaires on death row. Not in Texas, and not in any other state that has capital punishment in the USA. 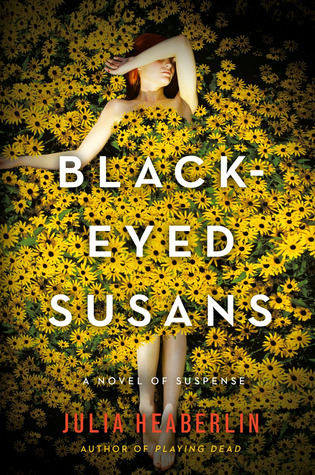 This entry was posted in beach reads, mystery and tagged beach reads, Black-Eyed Susans review, book blog, mystery, thriller by seattlebookmama. Bookmark the permalink.